You have to watch where you go around here. While you’re watching out for cow patties and turkey droppings, you should keep your eye out for the boy’s latest project hanging out behind the shed….ready to jump out and scare the beejeebers out of you. He skinned it. With the help of his brother, some sharp knives and mom being out of the house, the boys skinned the possum our little 8 year old trapper caught. I found out about it later….after I returned home from a trip to town. I heard him announce, “I just had one of the best days of my life”. Usually, when the boys utter such comments, it has something to do with guns, knives, and something dead. This isn’t the first time they have skinned the animals they have trapped. 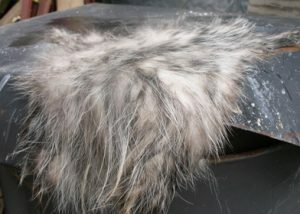 They have several skins and furry tails hanging on their wall…all with a great story to tell. After a long hard day, when the children are in bed and it is quiet in the house and I finally get a moment to sit and rest, enjoying a cup of hot tea and a slice of warm buttered banana bread, those furry tails usually come out and haunt me. Somehow, and no one knows how this happens because I have asked, the boy’s furry tail trophies come off the wall and find their way into strategic places with the sole purpose of taking years off my life. What would you think if you saw a squirrel tail sticking out from under the couch right by your bare foot? I have learned not to always assume the animal is dead. Once I was sitting at the table enjoying a late night conversation with my husband and looked down near my foot to spot one of the boy’s fake plastic snakes. I commented how I couldn’t believe how real those silly plastic snakes look…to bend down further and see the thing move. It wasn’t fake and it wasn’t plastic. Now I’m realistic. I am a mother with 5 boys. Now I need to hurry up and go back to the store evidently. My little man tells me he needs some mink oil and some other “chemical” I forgot the name of and that is probably illegal. They have quite a biology class going on. The great thing about this class is that his 11 year old brother is teaching it! I’m still laughing! Yes, I know just what you are talking about! With two boys (aged 9 and 11) who are always on the lookout for something else to practice their shooting or mounting skills on, life doesn’t get dull around here, either. What a glorious childhood they are having! What wonderful men they will become one day!